With access to a wealth of opportunities and resources, the AFT has something for you. Many of the AFT’s benefit offerings are through our affiliation with Union Plus, the AFL-CIO benefits program. 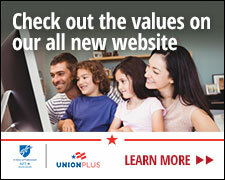 New Union Plus programs have been added to the AFT + roster of benefits to bring you savings on an even wider array of products and services. With the purchasing power of 1.5 million members, together we are able to access a wide array of quality programs and services.